100 foil wrapped sachets. Also called Asian, Chinese or Panax ginseng, Korean ginseng is a common medicinal herb for treating a range of health ailments. 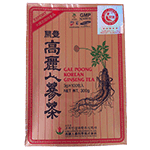 Korean ginseng tea may be helpful with male infertility, diabetes, chronic fatigue syndrome, colds, infections or flu. You can also take Korean ginseng to boost your immune system and athletic performance. Korean ginseng does have several side effects, however, and they may be mild to potentially dangerous. Product of South Korea.